Up, up and away - It’s time to take notice. Diesel fuel prices continue to rise and have now been above the three dollar mark for the second week in a row. This week the national average retail pump price for diesel jumped 3.2 cents to $3.042 per gallon. This is 48.6 cents higher per gallon compared to the same time period in 2017. It really matters where in the US you are operating your trucks, move your goods and buy your fuel. As would be expected the west coast (driven by California) leads the country with the highest diesel fuel costs $3.714 per gallon up 4.5 cents last week. The New England region was the least expensive at $3.117 per gallon up just 2/10ths of a cent. Currently, there are more trucks on the road than ever before with approximately 850,000 vehicles using diesel to move goods across the country. We have seen oil prices trending higher for the last year as demand for fuel grows and as OPEC, Russia and other major producers moved to limit their output and reduce the global overabundance of crude. This is being further fueled by policy measures that the US has taken with the restoration of punitive sanctions against Iran. In addition, Venezuela, the world’s third largest oil producer struggles with their own economic and political challenges, reducing their output. There are other potential concerns that could drive fuel prices north of four dollars. National Oceanic and Atmospheric Administration (NOAA) is forecasting that 2018 could see a near or above normal hurricane season. NOAA said there's a 70 percent chance of 10 to 16 named storms developing this hurricane season. They expect that that this could result in five to nine of the named storms potentially becoming significant hurricanes. The Gulf of Mexico is a major transport hub for fuel. This area of the country has the nation's biggest concentration of refineries. Last year a devastating hurricane season knocked out about a quarter of U.S. refining capacity along the Gulf Coast causing a sudden spike in fuel prices. The impact of increased fuel prices on express shipment costs should also be noted. 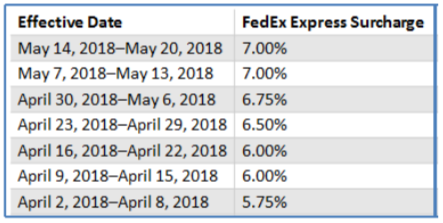 The following chart of FedEx Express shipments shows an increase of 1.25% in their published fuel charges in the past seven weeks.